Petroleum Jelly Overdose is the (excess) consumption of petroleum jelly or Vaseline. 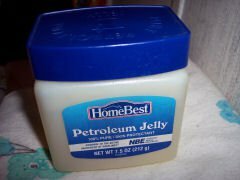 What is Petroleum Jelly Overdose? What are the Causes of Petroleum Jelly Overdose? A Petroleum Jelly Overdose occurs when an individual ingests petroleum jelly, or exposes the product to their eye, causing various symptoms. What are the Signs and Symptoms of Petroleum Jelly Overdose? How is First Aid administered for Petroleum Jelly Overdose? Who should administer First Aid for Petroleum Jelly Overdose? What is the Prognosis of Petroleum Jelly Overdose? Petroleum jelly is considered a non-toxic substance. A full recovery from Petroleum Jelly Overdose is very likely. How can Petroleum Jelly Overdose be Prevented? Shannon MW. Emergency Management of Poisoning. In: Shannon, MW, Borron, SW, Burns MJ, eds. Haddad and Winchester's Clinical Management of Poisoning and Drug Overdose. 4th ed. Philadelphia, Pa: Saunders Elsevier; 2007:chap 2. Tavares, C. N., Kimbrel, J. M., Protus, B. M., & Grauer, P. A. (2014). Petroleum jelly (vaseline balls) for the treatment of constipation: a survey of hospice and palliative care practitioners. American Journal of Hospice and Palliative Medicine®, 31(8), 797-803. Thomas, S. H. L. (2012). Low-toxicity ingestions. Medicine, 40(2), 53-54. Park, E. K., & Song, K. W. (2010). Rheological evaluation of petroleum jelly as a base material in ointment and cream formulations: steady shear flow behavior. Archives of pharmacal research, 33(1), 141-150. Sejben, I., Rácz, A., Svébis, M., Patyi, M., & Cserni, G. (2012). Petroleum jelly-induced penile paraffinoma with inguinal lymphadenitis mimicking incarcerated inguinal hernia. Canadian Urological Association Journal, 6(4), E137. Boynton, J. R., Searl, S. S., Heimer, J. L., & Miller, E. A. (1988). Eyelid oleogranulomas caused by petroleum jelly injection. Archives of Ophthalmology, 106(4), 550-551. Becker, A. J., Stief, C. G., Truss, M. C., Oelke, M., Machtens, S., & Jonas, U. (1999). Petroleum jelly is an ideal contact medium for pain reduction and successful treatment with extracorporeal shock wave lithotripsy. The Journal of urology, 162(1), 18-22.